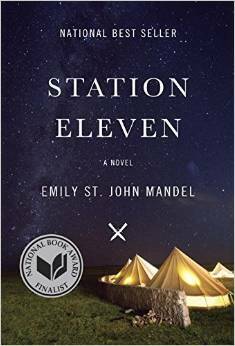 I have been shaken out of my reading lull with Emily St. John Mandel’s wild, beautiful book Station Eleven. The book moves back and forth between two very different but related worlds. One world is the world today as we know it and the other is the one that exists after a pandemic kills 99% of the human race. The book opens in a theatre in Toronto where aging and legendary film actor Arthur Leander plays King Lear for his final time. He suffers a massive heart attack on stage and dies. A member of the audience runs to help him, the same man who years earlier, had as a paparazzi, stalked Leander and his wife Miranda outside his Hollywood mansion. When the paparazzi/medic leaves the theatre he calls a friend who tells him people are dying everywhere – that he should get out as soon as he can. This last evening marks the end of the ‘old’ world. The new world order picks up with characters whose iives at some point or another have intersected with Arthur’s’ life. By moving back and forth between the old and the new world we not only find out about Arthur’s life but also of those who survived the pandemic. The new world picks up in year twenty with Kirsten, who is now in her twenties and a survivor of the old world.She had been a child actress in the old world and now travels with a Shakespearean Theatre caravan who roam from settlement to settlement and in between dodge the dangers of a civilization that has become entirely undone. Nothing remains of the old world except ghosts of its former structures, abandoned houses, cars, buildings and airplanes – meals left half eaten, skeletons fully dressed lying in beds, on roads and in cars reminding the survivors of another life and time. This merry band of artists and actors called the Travelling Symphony travel under the banner “survival is not enough” a line taken directly from Star Trek. As a part of her old world possessions Kirsten has two limited edition comic books in her possession called Station Eleven which tells the story of Dr. Eleven, a physicist who lives on a space station after escaping an alien takeover of Earth. These comics at one time belonged to Miranda Leander, Arthur’s first wife, who was their author. So what does all this mean? This book is more than just a story of a fading actor and his empty life. It’s more than a dystopic vision of post modern collapse and the end of the world as we know it. This is a rich novel where art and life are inextricably intertwined and it’s as though the world is a stage. And indeed the novel opens with Arthur in his last moments playing one of the greatest characters in literature – King Lear. This theme continues with Miranda’s comics. She is driven to create a world that mirrors her own strange life in many ways. And as these comics get passed on they become the lifeblood of inspiration to two characters (Kirsten and the cult leader) in the new dystopian world. And in many ways the post pandemic world resembles Station Eleven – an outpost world created out of the ruins of the death of a civilization. And again, there are moments in the book, for example when Arthur is dining with his old friend and he notices that Arthur is no longer himself but is acting. It could be a commentary on the shallowness of Arthur and the world he lives in but it’s also the indivisibility of life and art. Life and art flow through each other like a river. Life without art is only survival as the Travelling Symphony knows. It elevates the human condition on every level and in the end it saves us from ourselves, each other and from barbarity. It’s what makes us a mensch. I feel that Emily St. John Mandel has written a book that lays art against a bleak hopeless world (both the new and the old) and shows us that everything from comics to film and theatre including old standards like Shakespeare make the world an infinitely better more hopeful, and more feeling place.